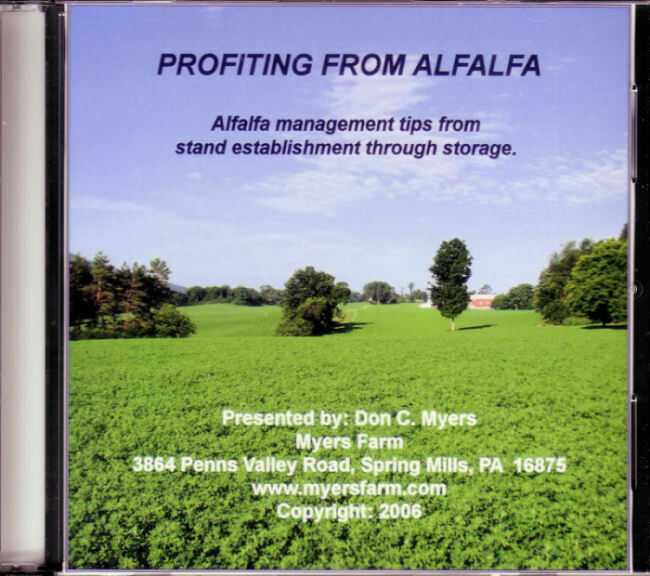 Myers farm alfalfa balage management production practices and tips for central Pennsylvania. We have a 27 minute DVD available presenting in-depth information about each of the tips below. Complete information can be found at the bottom of this page. 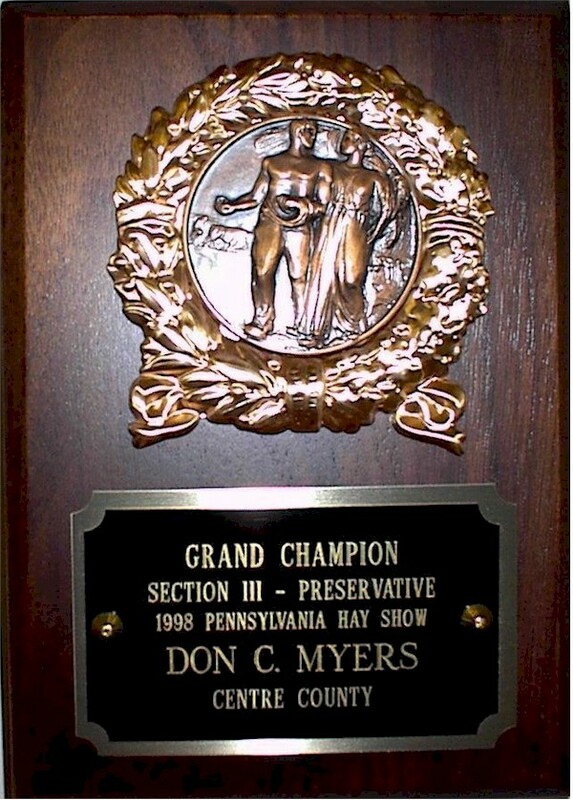 All farmers have their own preferences when it comes to making quality hay. There certainly isn't any one right way. Different things work better for some people than others. However, each year when I go to the field, I try to do things better than I did the previous year. Each year provides us with a learning experience to carry forward to the next year. In addition, technology is always changing. The tips which are listed here have worked well for us. It is unusual for us to have forage tests of our balage with less than 22% protein and a relative feed value of 150. When everything goes right, some tests have come back with protein over 24% and the relative feed value over 200. Maybe some of the ideas and thoughts here will help you be able to produce a higher quality crop. Seed as early as possible in the spring. If possible, apply lime and fertilizer according to soil tests while the ground is frozen in late winter. Generally the first cutting of our new seedings is ready to harvest the same time the second cutting of the established stands is ready. Good weed control, either through preplant tillage or chemicals, is essential. Also, monitor the new seedings and control weed problems as they develop. Select from the newer, high yielding, high quality varieties. Seed cost spread out over the life of a stand is relatively small, especially if higher yields are obtained with the newer varieties. Consider no-till. We've been totally no-till for over 15 years and have had excellent results with no-till alfalfa. 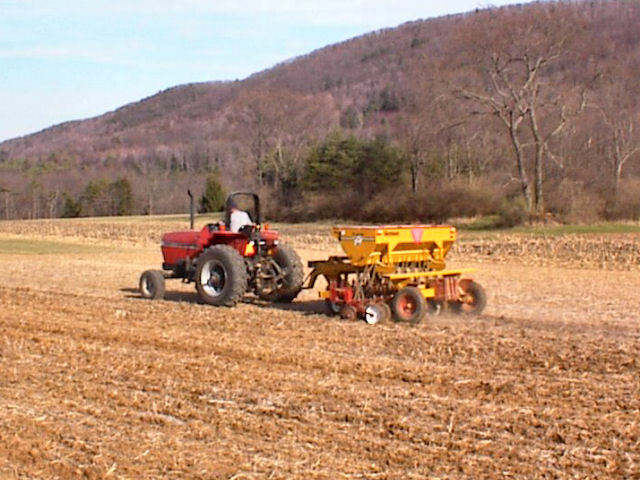 No-till significantly reduces the erosion hazards from hard rains while a new seeding is becoming established. Control weeds! Consider using a dormant application of Velpar or a similar chemical for winter annuals on established stands. Watch for annual broadleaf weeds and grasses between cuttings. An application of Gramoxone immediately after baling can control many of these annual weeds at a low cost per acre. Do not over apply Gramoxone! Maintain good fertility levels. Alfalfa loves potash. Make sure you have adequate micro nutrient levels. 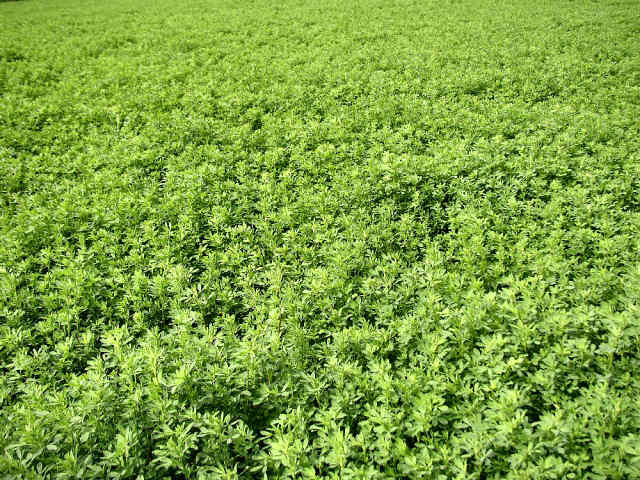 University test show that under drought stress, alfalfa with a good supply of nutrients will significantly out yield plants which are undernourished. Monitor the stands for insects, especially leafhoppers, and take control measures as necessary. Keep a very close eye on stand maturity. I try to start cutting within a few days after I can feel the bud forming at the top of the plant. Cut when the crop is dry. Dew or rain create that much more moisture which must be dealt with when wilting or getting a crop dry enough to bale. Don't cut too close to the ground. University tests indicate that alfalfa has the highest feed value when cut in the mid afternoon. Give consideration the period of time in the day when the maximum drying takes place, as well as the anticipated drying conditions. If you are wilting the crop for balage, consider placing the hay in a swath and not a windrow when cutting. Check to see if your conditioner rolls are properly adjusted. Ours are always set at the minimum gap recommended in the owner's manual. Also, check the roll pressure adjustment. Is there a difference in the effectiveness of different styles of conditioning rolls or conditioning systems? If you are harvesting legumes for dry hay, consider chemical conditioners (drying agents). Based on personal experience, they do work. If you should happen to have a V-type wheel rake, consider making a flat swath to bale instead of a row. With a wheel rake driven at the proper speed, we place two 10' mower-conditioner swaths into one 52 inch wide flat swath for baling. 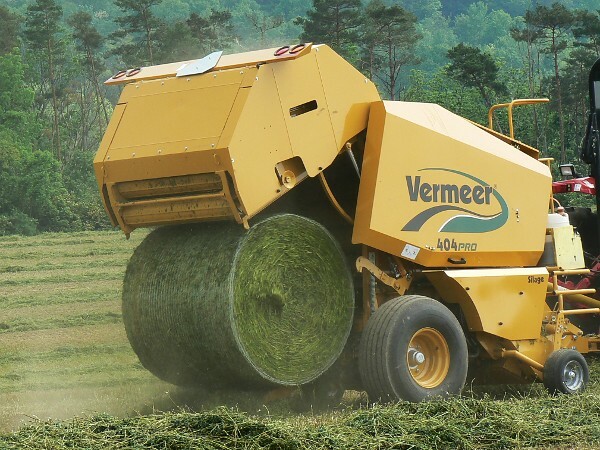 This results in much less operator fatigue when baling since no weaving is required, and it allows us to produce extremely well shaped bales. Consider using a preservative. When we started making balage, I tried Cargill's Storage Mate. I never have complaints from customers about spoilage, so I've continued to use it on all of our balage. Consider triple wrapping the bales. Yes, it does significantly increase the cost of the wrap per bale, but once again, we do not have complaints about spoilage. A round baler with a cutter mechanism will allow the bales to be packed tighter. Also, if the bales are feed from a round bale feeder, there is less feed loss. Wrap the bales within 4 hours of baling. Store the bales on end. The ends have more wrap on. Also, store them on a well drained area. We have a gavel pad for the balage. It is rare to have any rodent damage. Remember, every leaf left on the ground after harvest means quality of the harvested crop has been reduced. I would like to say a special thank you to Jim Huber of Triple H Equipment at Peach Bottom, PA, and to Mike Galbraith with Cargil for the numerous tips and suggestions they have given me over the years. 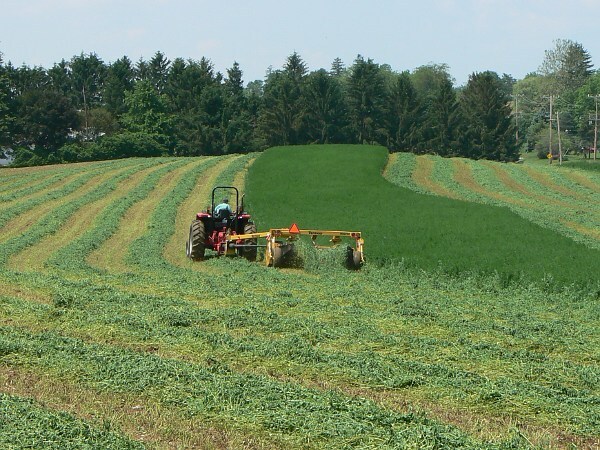 Through the years we've gone from being a producer of mostly timothy hay when I was quite young, to producing quality dry alfalfa hay primarily for use by dairy farmers, to specializing in quality alfalfa balage production. 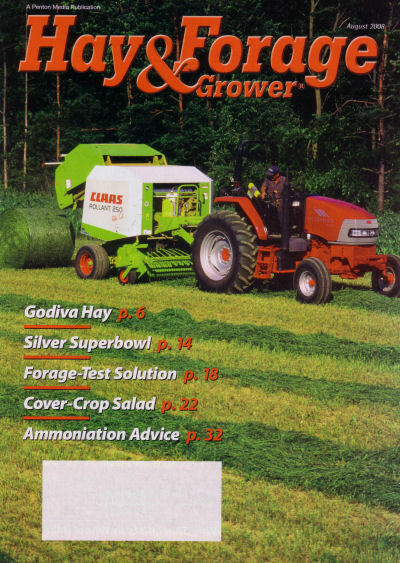 We've used new technologies as they've come along, starting with dry hay preservatives approximately 25 years ago. We've used drying agents, as well as the automatic moisture reading preservative applicators before switching to balage. Through personal experience, we've learned many things which have worked for us. The DVD runs 27 minutes, and details practices which have helped us to produce a quality product. If you would like to purchase the DVD, the cost is $15 (United States Currency). The price for US orders includes shipping and handling. You may order on-line using the secure PayPal button below.